This week, the Sikh community literally let their hairs down as they celebrate the spirited Vesakhi festival. Singapore Khalsa Association (SKA) hosts the final rounds of Vesakhi celebrations on Sunday, with exuberant family-styled activities. And indeed in their humble, yet rousing, way to really paint the town red, the genuine Sikh-way. Privileged to meet so many inspiring newsmaker-Sikhs last night. I gave a tribute speech to 89-year-old Ajit Singh, a hockey Olympian at the 1956 Melbourne Games, who even now bounces like an energetic teenager! There were other celebrity Sikh folks like retired military-icon and former Singapore Cricket Club (SCC) president Colonel Gurcharan Singh, award-winning ex-Straits Times journalist Santokh Singh (Chairman of Vesakhi 2016), sparkling business folks Sapuran Singh and Puran Kaur (former SAF Majors and now owners of Moshi Moshi Bollywood, the hottest Indian joint in town! ), retired Major Tarlok Singh (former international hockey striker and Chairman of Vesakhi Golf 2016) and, indeed, newly-minted SKA President Mohinder Singh. Yes, ex-hockey stars like Gopal Singh and Paramjeet Singh, too. What thriving Vesakhi spirit among the Sikhs, truly a minority turban-community, with majority pride and passion, to distinguishedly integrate as part of the Singaporean community. 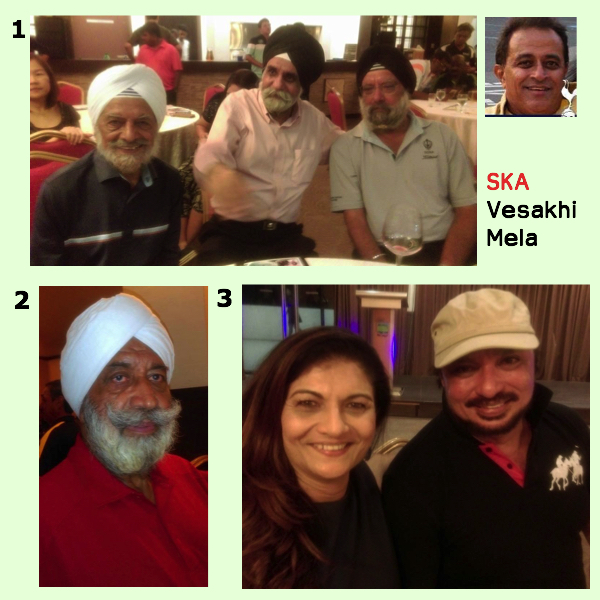 And I’m so excited, come middle of the year, SKA will have a new re-decorated multi-million-dollar clubhouse at Tessensohn Road, off Balestier Road, where the Made-in-Singapore Sikh “samba” will continue to flourish, with the younger generations in mind..
1. Turbans who make a very big difference: Former Straits Times News Editor Santokh Singh (middle), the Chairman of the Vesakhi 2016 committee, with Olympian hockey star Ajit Singh (left) and Charanjit Singh, Past SKA President. 2. Retired Colonel Gurcharan Singh, perhaps one of the most distinguished Sikh icons I’ve ever met. He stands out prolifically wherever he goes and instantly garners respect. The first Sikh, too, to be President of the Singapore Cricket Club. 3. Probably the most bubbly Sikh couple in town: Sapuran Singh and Puran Kaur, two former SAF senior officers, now into business and jointly running Moshi Moshi Bollywood, probably the hottest Indian entertainment joint in town. For the record, the dashing Puran stands out as the first non-Chinese woman SAF Major, who even did an ADC stint at the Istana. Extracted from the Facebook posting by Suresh Nair on 28 May 2016. The veteran Singapore-based journalist now also conducts freelance strategic, crisis and media training.